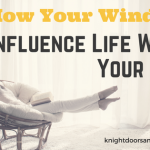 We’ve all been there: you get home after a long day of work, and all you want to do is get inside, pour yourself a drink and relax. But, when you go to open your garage door, it just won’t lift! 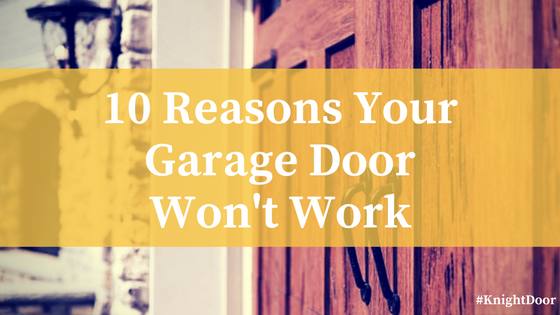 There are many reasons why your garage door won’t work, but here are the 10 most common reasons. 1. Transmitter batteries are dead. If the batteries in your transmitter are dead, the transmitter won’t be able to send a signal to your garage door to open. Before you jump to conclusions, check to see if the transmitter on the wall inside your garage still opens the door. If it does, then your car transmitter likely just needs a battery change. Make sure that when changing batteries, you change them in all transmitters. They were likely installed around the same time. 2. Photo Eyes are out of alignment. Photo eyes transmit an invisible beam between one another that detects if anything is in the path of your garage door when it closes. Your garage doors photo eyes are a safety measure that prevent automatic garage doors from closing on top of something or someone, causing serious injury or damage. If you notice your door opens normally but won’t make an attempt to close properly, inspect your photo eyes. Over time, they can get dirty, scratched, or misaligned. Check to see if you can clean them; if not, check to make sure they are pointing at each other exactly. The metal track your door runs on needs to be aligned properly in order for your door to move. Tracks that are misaligned can be a serious issue. If you see gaps between the rollers and rails, or bends in the rails themselves, you will need to have your door inspected by a professional. The heavy weight of the door can compound these issues, causing your door to become dangerous to operate. 4. Issues with your transmitters. Your neighbours could be running their garage door on the same frequency as yours, which can cause your door to open along with theirs. There are many reasons your transmitter might not be working properly. The most common reason is that you are simply out of range, and need to get closer for it to work. Another reason could be that the antenna in your garage is free from obstructions or damage. This can result in issues with receiving the signal. If your door opens or closes on its own, make sure your transmitter isn’t stuck under something. If it isn’t, you may need to check the frequency of your transmitter. You may also need to reprogram your transmitters. 5. Something is blocking the path. If you find your garage door closes part way then goes back up, there may be something on the ground blocking the door’s path. This goes back to #2, where your door has a system in place to avoid crushing objects in it’s path. Make sure nothing is under the door that is blocking the path. Another reason for this could include a build-up of debris on the tracks, which prevents the rollers from moving forward. Inspect the area around your garage door to make sure nothing is blocking the path or the photo eyes, then check the tracks for debris. Run a damp cloth along each track to remove anything that may be lingering. 6. Your springs have broke. Springs are only good for a certain number of open-and-close cycles. If you know for a fact your transmitters are working and there is power going to your operator, you may have broken tension springs. If this happens when you’re home, you will hear a loud bang from within your garage (similar to a firecracker). Why is this? Because it’s actually the heavy-duty springs that do the heavy lifting when it comes to your garage door. If you have a broken spring, call a professional as soon as possible to come and replace them – Never try to replace them yourself! 7. Door limit settings are wrong. If your limit settings are too high, the door will hit the ground before the opener thinks it should. The limit range tells the garage door opener how far the door should move before it’s fully closed. There are knobs or dials on your operator that you can use to adjust the limit settings. Your owner’s manual will have instructions on how to adjust your limits. If you find this isn’t working, call in a professional. 8. Someone enabled the disconnect switch. Every garage door opener comes with a disconnect switch so you can manually open or close the door if you lose power. If it sounds like your operator is running but your door isn’t moving, chances are the disconnect switch was hit. Every operator has one of these switches in the event of a power outage. This allows you to open and close your door manually so your car doesn’t get stuck in your garage. The switch is generally a rope that you can pull or a knob you can turn to disconnect. 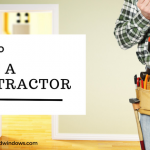 You will need to ensure that it gets reattached to your door so you can open and close it again. 9. The door lock is set. If your garage door won’t open and the operator motor only runs for a few seconds, the garage door may be manually locked. Many doors come with manual locks for added security for your home. This typically looks like a knob or handle in the middle of the door with a bar running horizontally from each side. There is a button on the top or side that can be hit to lock the door. To unlock the door, simply turn the handle until you hear a clicking sound. 10. The cables have broke. If the tension springs break, quite a bit of tension is put on the door cables, and they will often break next. Along with the tension springs, garage doors have cables that assist in slowly and safely lowering your door. If either of these breaks, you might find that your garage door is closing too quickly and with a loud bang when it hits the ground. This can make it very dangerous to operate your door, as there is nothing stopping it from crushing something that might be below it. If you notice your cables have broke, call a professional to come and repair them as soon as possible. Try to refrain from operating your garage door while it’s in this condition. If you have any of these issues with your garage door, please contact us today. We will be glad to help you!